Movement and disability: Does mainstream discomfort keep those who crawl immobile? First, there’s the issue of healthism. See our blog post which talks about healthism and respectability here. Caring about your health is your choice. Smoking is wrong, in part, because it harms others. (This is a bit complicated in a country with publicly funded healthcare. Presumably this gives the government some scope to encourage people to make healthier choices.) But second, and more importantly, sitting isn’t bad for everyone. For some people it’s the best choice. Think about a wheelchair user for whom sitting in a chair opens up a world of mobility and choices. That’s not unhealthy. It’s liberating. I’ve watched how this plays out in campaigns about using the stairs. 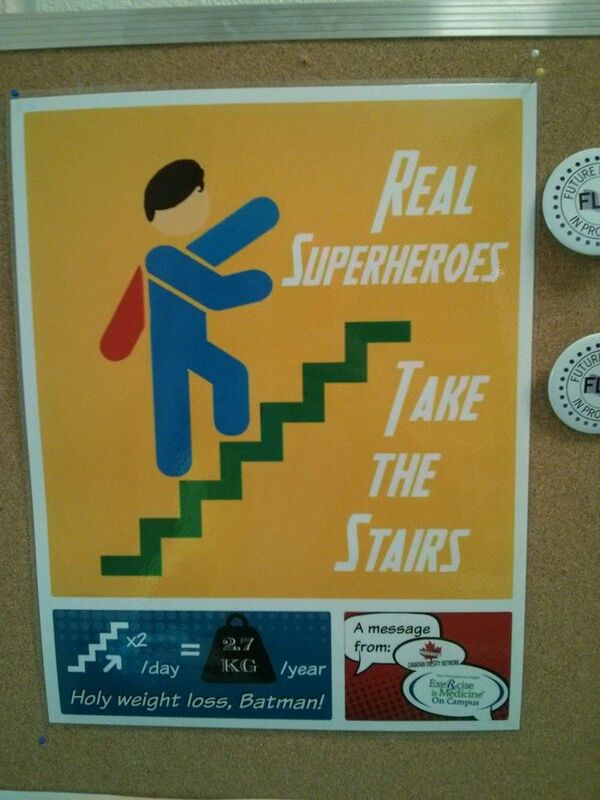 See this poster which many friends shared with the comment, “Real super heroes don’t make ableist assumptions.” After all, not everyone can take the stairs. Indeed, when my knees are bothering me sometimes I’m not able to use the stairs even though I can bike hundreds of kilometers. It’s certainly true that wheelchairs can be wonderfully liberating things. See the other Samantha’s post about the Warrior Dash. That wouldn’t have been possible for Samantha without her wheelchair. But I also worry that mainstream discomfort with non standard modes of movement can keep wheelchair users inactive. The message seems to be if you can’t walk, you use a wheelchair, even if that’s not the option you’d prefer. One of my favorite characters in the documentary Fixed, which by the way, you must watch, it’s a wonderful film, is Gregor Wolbring a professor at the University of Calgary. He uses a wheelchair but it’s not his only way of getting around. I love the scenes of him at home, getting in and out of his car, and boarding a plane crawling up the steps and down the aisle to his seat. At home he quickly sheds the wheelchair and gets about his house under his own steam. His movement is graceful and speedy but it challenges our stereotypes of how the human body moves. Watching him board the the plane I wasn’t sure if it was the air line staff who were uncomfortable with the way he climbed the stairs into the plane or if it was me. I’ve watched the film a few times now because I use it in class and I’ve wondered about my unease. Partly it’s fear of Gregor Wolbring falling but that’s clearly ridiculous. We’ve both been getting about using our preferred modes of mobility for some number of decades. I hope no one worries about me falling when I climb stairs. Is it undignified? That’s clearly an ableist thought. How do standing and walking come to signify “dignity”? It seems we have two acceptable modes of being, walking and wheeling. But wheeling isn’t the only option for those who can’t walk. Our discomfort with crawling shouldn’t be the thing that keeps people still when independent motion is the option they’d prefer. Fixed makes the point that there is incredible variation in human abilities. We should delight in variety, not shy away from it. It urges us to resist the urge to pick one standard and “fix” everyone who doesn’t meet it. I think this about size. So too with mobility. Finally, there’s the worry that things that are wonderful for some people–moving sidewalks in airports, elevators in private homes, even second floor laundry–aren’t wonderful for others. How do we celebrate increased accessibility without turning into a country where we all use moving sidewalks and elevators? Yes, let people choose. That’s obviously right. But we need to encourage a culture of movement in its many forms and varieties. I’ve spent a fair bit of time with some amazing disabled cyclists. In Australia I rode with Michael Milton, a one legged cyclist. I’ve raced crits with him, he’s not slow. He doesn’t generally use an artificial leg which surprises people and I’ve never seen him in a wheelchair. Mostly he uses his bike for transportation. Michael John Milton OAM is an Australian Paralympic skier, Paralympic cyclist and paratriathlete with one leg. 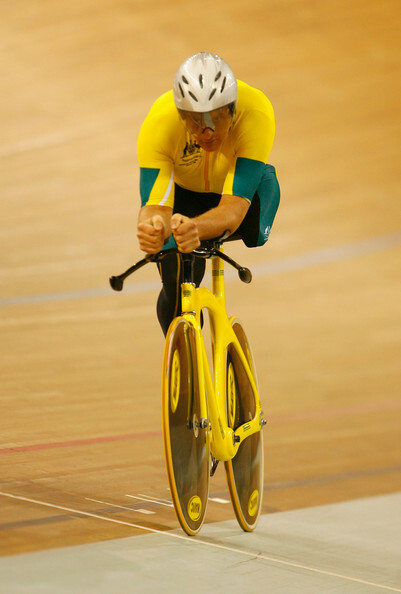 With 6 Gold, 3 Silver and 2 Bronze he is the most successful Australian Paralympic Athlete in the Winter Games. Let’s move, yes. But let’s celebrate human diversity too. It’s not all a matter of sitting or standing, taking the stairs or taking the elevator. Let’s embrace all the options. Outstanding essay! So much to chew on here. I am now aware of the concept of “ability privilege” (like white privilege) which makes it possible for me to be unconsciously insensitive to abilist messages in the health and wellness community. My eyes are open now, thanks to you, and I won’t be able to close them again. Thank you. I have so much to say about this because sitting in itself, isn’t evil nor terrible. It’s not terrible to sit for 4 hrs. straight before we take a break. It’s more on ergonomic health how our computer, chair and table is positioned in relation to one another. And resting our eyes occasionally, flexing arm muscles, etc. It’s what we do with ourselves physically in movement outside of sitting. *I had a long time friend who had a severe case of astigmatism. She was legally registered blind with the Canadian National Institute for the Blind. But she obtained her university degree, worked for several MPs as an ardent Liberal, full time career with a bank in estates, trusts. A very outgoing person but she used to get annoyed when I “forgot” her disability. She reminded me she could not bike as able-bodied, etc. *Having a recent head injury myself…it is a hidden disability temporarily which many people can’t quite see. So I’ve done a lot of sleeping and sitting around to heal…off the bike. In the past 10 years (out of last 24 yrs. of regular cycling), I no longer trumpet my cycling trip distance accomplishments to other non-cyclists or occasional cyclists or people trying to become healthy. I just talk about joy of cycling (if I sense they want to hear this direction) and what I see on bike. That’s all. After all, I don’t really care to hear people at workplace, who are joggers, talk about the 10-40 km. run that they did. Because I’m not a jogger and am not interested at all….even though I am exercise oriented. Life is short and there’s a lot of other stuff to learn. Sure, I say “great” to them and walk away. I don’t even read blogs that are cycling training journals or blogs that are running training journals. For certain, I chose not to have a blog that was a bike training blog about me. In the end, who truly cares? Not my family, not my closest friends. Only me. I don’t wish to waste reader’s time on my own foibles of training day by day. They could learn broader things about the world I inhabit. For certain a wheelchair reader might have a harder connection/less motivation to regularily read of an able-bodied marathon runner’s daily training journal/similar blog. I say ease off from expecting the world to always cheer you on bike ride, or endurance run… because one day you won’t be able to do it. It might be near the end of life but find other passions now, that express yourself that will bring more people… able and differently abled readers/people along life’s journey. Just a note about sitting: Don’t take this basic movement and posture for granted. Anyone who has seen someone dying/palliative care, as I have late last year of my father, it is wretching to see someone you love, try to pull up themselves to sit. But they no longer can. This is a guy who had prostate cancer. He was very healthy, no cardiac, respiratory problems at all in his life up to 85 before he died. He was slight underweight his whole life (which might explain why I inherited a small frame from him.) No drinking, stopped smoking after he married my mother. Gills! I want gills so that I can swim and dive without worrying about having to extract oxygen from air! I am all onside for tissue engineering and bionic body parts. This kind of bioengineering is teaching us a lot about how the brain and nervous system work, and how to harness that energy in developing bionic limbs/ears/eyes. I don’t agree that these are misplaced priorities, and I think that wheelchair technology has come a long way; witness the vehicle in which Gregor Wolbring moves around, and those that enable athletes to play basketball and sledge hockey and race marathons. But perhaps that’s “able privilege” talking; I would love to see Fixed.